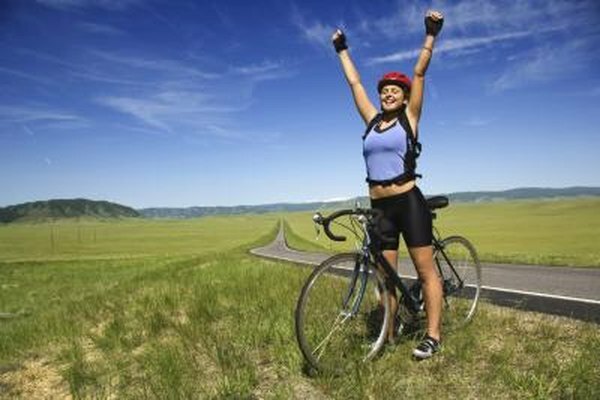 Shortness of breath while biking can occur during any style of riding. Whether you are a casual or long distance competitive rider, you will have to use some form of a breathing technique to finish your ride. Breathing techniques during biking are a very important feature for optimizing and increasing your riding performance. Concentrating on your breathing can offer you a positive diversion from exhaustion during your ride. The American Council on Exercise notes that when you are focused on your breathing techniques your respiratory muscles are strengthened and breathing becomes more efficient. The muscles around your lungs will eventually require less energy, therefore, releasing increased energy to your legs when you require it most. Breathing techniques can immediately improve your biking and are a vital step in helping you reach your peak performance. Deep breathing allows your lungs to expand with extra oxygen as you inhale, and assists with your physical conditioning and performance. Try inhaling as much air as you can and immediately exhaling, as you return to your desired breathing cadence. In an article for the Cycling Performance Tips website, Dr. Richard Rafoth states that people generally only use between 10 and 15 percent of their lung capacity during normal breathing. When biking you might have a tendency to increase your rate of breathing, not the depth of your breathing. Although deep breathing uses slightly more energy, the result can be the edge you need in pushing to the finish line. Diaphragmatic breathing into the abdomen inflates the lower lobes of your lungs, helping you to relax. Your heart rate will begin to decrease because your blood has more time in your lungs, increasing the effectiveness of your breathing. Breathe in for a few pedal strokes and breathe out forcefully. This breathing technique is predominantly useful when biking on an incline and climbing steep slopes. Performance breathing consists of synchronizing your breathing with what your body is doing. Try to breathe in through your nose for a few pedal revolutions, hold your breath for a few pedal strokes and then breathe out slowly. Get the basic rhythm down and pace your breathing with your pedal stroke cadence. This will assist your pedaling cadence and body in working together, establishing a focal point while you are biking. Core Performance: Performance Breathing: Does it Work?